The Front Page - 2017 TWC MODDING AWARDS - Winners Revealed! 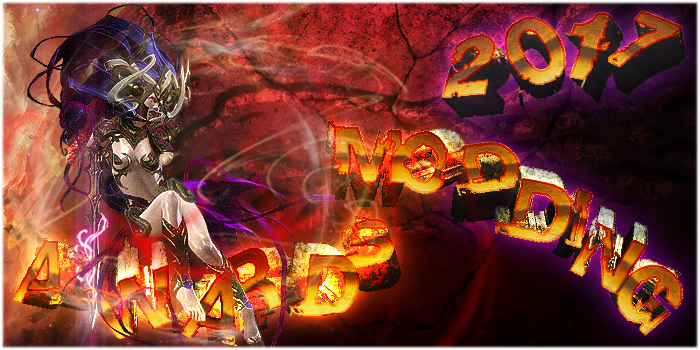 Esteemed fellow TWCenterers and guest alike, is with great pleasure that the Eagle Standard is informing you all that the 2017 Modding Awards are finally over and that therefore the winners have been revealed! Please feel free to stop by and congratulate with all the winners. One due notice: due to my personal real life issues, the whole Awards have been delayed of at least two months, and I truly ask everyone's pardon, especially of the Committee Members, who had to wait for me despite the things being ready since a long while. Similarly, I want to thank Hader for stepping in quickly when requested and for helping out with posting the nomination threads, much appreciated our dear Lord Inquisitor! The 2017 edition has seen the introduction of the latest TW title released, Warhammer 2; as happened for Warhammer 1 last year, it indeed attracted some interest but it being a new title, the actual number of nominations and votes involved resulted very scarce. Rome 2, for the first time, got the most number of nominations and votes, with Med 2 not that far away, and Attila a bit behind in third position.. it seems that the old titles are still having a good weight amongst TW games, at the least when it comes to modifications, but it also seems that the big amount of work done by modders on Rome 2 and Attila has definitely given very good results. Let's see some figures in deeper details. All in all, there have been approximately 660 votes, which represents a dramatic decrease of more than a 1000 votes compared to the 2016 edition; of course, 2017 edition has sensibly less categories which went to vote (roughly half of those of 2016) and this is due to both less categories as a start (no classical mod/modder or resource awards this year), but also to the fact that we had much less nominations, which forced the Committee to group up different categories in order to have enough nominations to warrant a vote. As mentioned the podium is composed by Rome 2, Med 2 and Attila respectively; amongst the other titles, Rome 1 and Shogun 2 closed not far from third position, and Empire, Napoleon, WH1 and WH2 all scored less or more the same amount of votes (between 30 and 40 each). The data about WH1 and 2 is really discouraging: one could expect more interest around these titles, but either there are too little mod or players or they are supported elsewhere, the result is the same deluding number of votes. In terms of categories, as usual the most part of the votes (around 50%) went to the Favourite modder categories, which, again, is not surprising I would say; without modders there won't be any mod and certainly the contribution modders give to the community is not limited to the mods they release. For all the sheer numbers, you can check the Archives where all the polls are stored. However, I'd like to higlight the winners of this edition. For what concerns our legends, Dresden won again in the Rome 2 and confirmed to be the big boss over there. Same story with Radious, who admirably won in both Warhammer 1 and 2. But the lion's share goes to Miguel_80, who crushed the competence this year, by winning in 4 (yes 4!!) different titles (Rome, Med 2, Empire and Attila) and by ending as runner up in Rome 2; sir, there are no words to congrat you for your crushing victory this year.. I was going to say that you really deserved an Opifex, but I see that I was not the only one thinking so, therefore ... On the side of new winners, I'm happy to see that both izzi (Shogun 2) and Bran Mac Born (Napoleon) finally reached the highest step of the podium, well deserved sirs! The complete list of winners and runners ups can be found on the Results Thread, still I'd like to spend few words more for our new entries of 2017: leoni, second runner up of Rome; Weierstrass second runner up of Shogun 2; Bavarian Grenadier, runner up for Empire; Commissar Caligula_, runner up of Warhammer 2; Petellius & UMCenturion both runner ups ex equo of Attila; SPARTAN VI, runner up in Warhammer 1 and second runner up in Warhammer 2. To all of you gents goes my special congrat, I really hope that this would only be the first price of a long career, ad maiora! A VERY IMPORTANT NOTICE: The Committee is looking for the input of the whole community, therefore we have started an OPEN DISCUSSION thread, which purpose is that of brainstorm ideas and collect feedbacks from the whole membership to see what we can (and should) be doing in order to revamp and improve these Awards; everybody is welcomed to participate, just read the OP and post #4 before posting. As usual, it is my pleasure to present you this edition's team; if you wish to show them your appreciation by leaving a small rep message, simply use the green button, thanks! Lastly, a usual a special thanks goes to all the members who have participated in the nominations and voting for this edition, and in particular to those who have shared their thoughts with the Team; we are always open to listen to new ideas, so keep them coming! on behalf of the Modding Awards Committee. Congrats to you dear sir! !